Turkey is often a country whose cuisine is associated with meaty kebab dishes, doner sandwiches, and lahmacun; where essentially the food revolves around beef or lamb. Although finding Turkish foods with meat isn’t difficult, the vegetarian variety is also plentiful – even if you’re eating out often. An overwhelming majority of Turkish foods are vegetable-based and these are 7 staple dishes you can add to your animal-friendly diet when traveling in Turkey. Probably the most deceptive vegetarian food name you’ll find, cig kofte was, until very recently, typically made with raw meat. 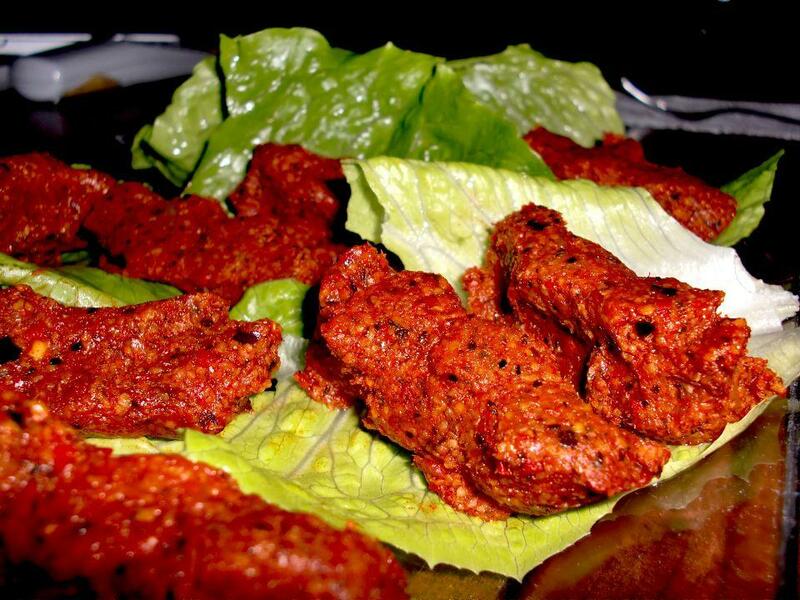 Although meaty cig kofte is mostly banned and uncommon in Turkey, it’s spicy vegetarian variety (substituting bulgur wheat rice for meat) is found on many a street corner, particularly in the central and south-eastern regions. This typically spicy, runny egg dish with onions, tomatoes, and green peppers is commonly found at bus stations, diners, and the table of many Turkish homes. Menemen is a breakfast food that’s not an uncommon sight at dinners and is best eaten with plenty of bread to soak up the left over juices. Often cut into small squares, this cooked pastry dish can be filled with cheese, spinach, or served plain in countless variations. Borek can also be filled with ground beef but most cafes and places offering it usually have at least one vegetarian version. 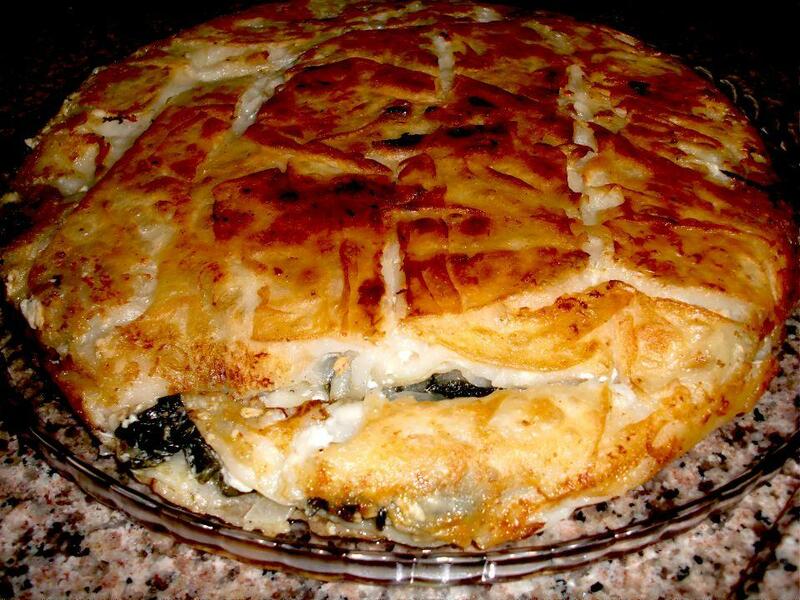 The most common vegetarian Turkish borek recipe uses either spinach or feta cheese, but if you ever find the (newer) eggplant variety, I suggest you not miss it. 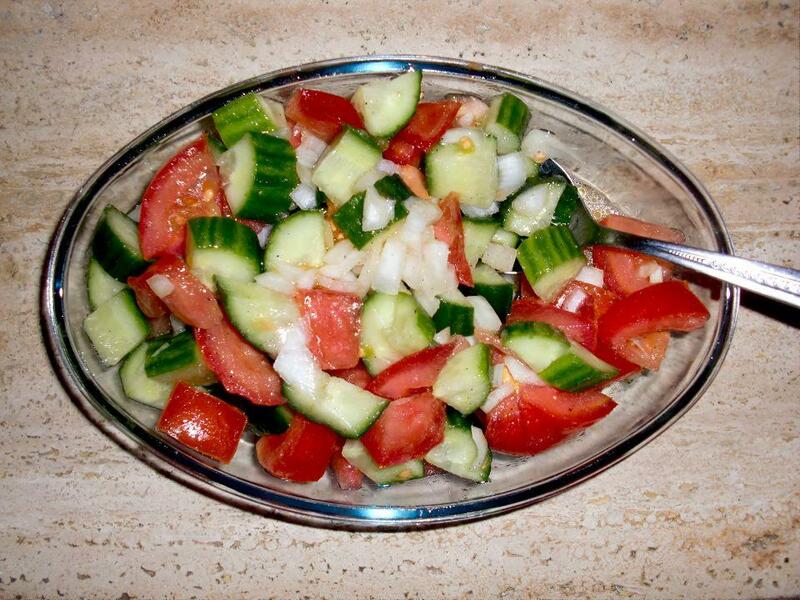 A mix of chopped tomatoes, cucumber, along with onions, that are usually topped with dill or parsley in a dressing of olive oil, lemon juice, and salt. Almost every restaurant in Turkey will have coban (pronounced “CHO-bun”) salads on the menu and if not, it’s just about the easiest dish to whip up in your hotel or hostel. 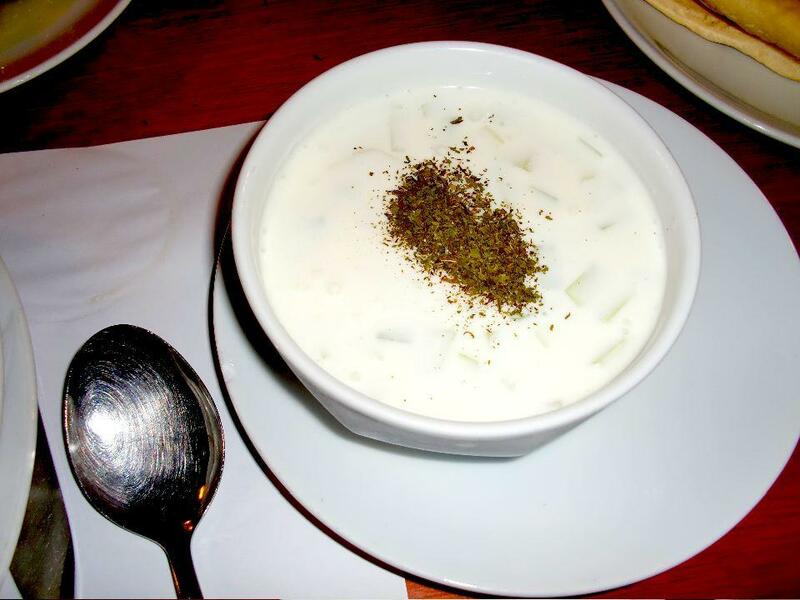 Sometimes refereed to as the Greek “tzatziki”, Turkish cacik is a more watery version of this yogurt, salt, and cucumber mix. Served as an appetizer, cacik (pronounced “JA-JUK”) is spiced up a bit with salt, olive oil, garlic, and dill as a base and found in all classes of Turkish restaurant. Both of these dolmas (yaprak sarmasi for grape leaves or biber dolmasi for stuffed peppers) also have meat versions that are served hot but these “zeytinyagli”, or in-olive oil, dolmas come cold and filled with rice. 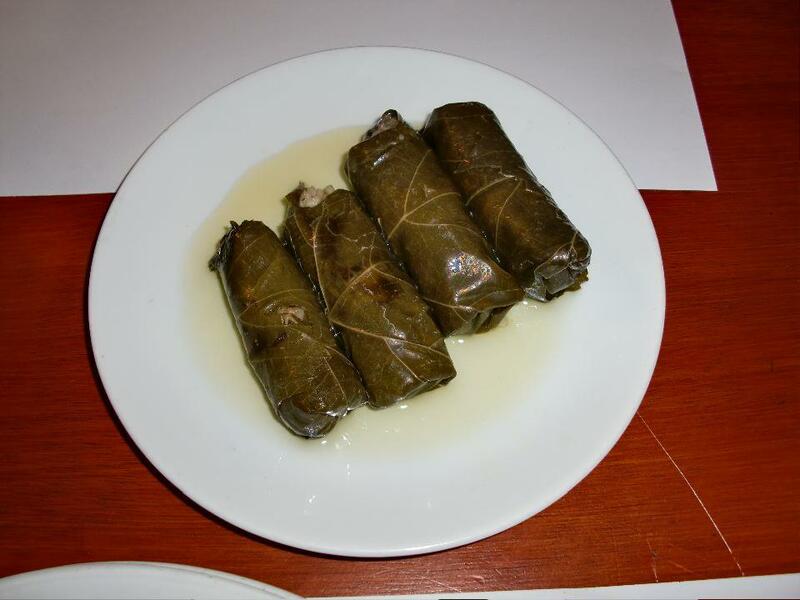 Below are an example of stuffed grapes leaves and here’s a glimpse of stuffed green peppers. 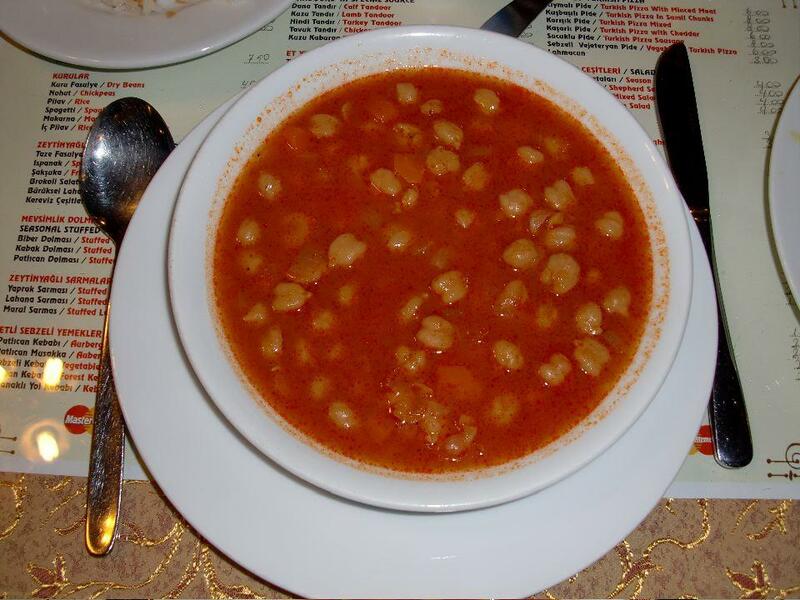 Chickpeas are one of the traditional peasant foods in Turkey that also tend to be vegetarian. I use the word ‘tend’ since some restaurants and cooks will flavor this (and other vegetable dishes) with a bit of ground beef. In most smaller restaurants and street kitchens however, that’s not often the case; just make sure you confirm the dish has no meat in it before ordering. The majority of Turkish food has a vegetarian base and is abundant in vegetables and grains. Despite this, kebabs and meat dishes are disproportionately advertised, potentially worrying vegetarian tourists about where they’ll find a decent meal. In a few days I’ll have much more comprehensive post for vegetarian travelers headed to Turkey; although you don’t have to be a non-meat eater to discover and enjoy this (rather large) side of Turkish cuisine. NextWould Traveling Be Quite As Fun Without Borders? With the spices and ingredients used in these dishes, meat isn’t even necessary! That borek looks outstanding as does that Turkish omelet. I am far from a vegetarian, but I am perfectly fine eating vegetarian meals as long as they’re tasty and flavorful. These all look outstanding. The menemen and borek look particularly yummy. Great descriptions and pictures. They have me very hungry!! As a bacon lover obviously I eat meat but even I often seek out vegetarian options as meat can really weigh you down if you’re eating it in every meal. What a trek for cig kofte/non-existent Chinese restaurant 😛 It was even better after climbing that hill (like 10 times). So was that a popular decision? Personally, I enjoy kibbeh nayyeh, and I wouldn’t want the government telling me I can’t have it! Partially the banning is to fall in line with European (EU) standards but also happened when mad cow worries were abound. There wasn’t much uproar in Turkey and you can still find it in some places; it’s just not the street food it once was. Now, they tried to do the same thing to kokorec (cooked intestine) and there was enough public push-back to prevent it from being banned. Have you tried kokorec? Is it good? One of my favorites; sort of tastes like fatty lamb with one powerful kick of spices served as a sandwich. I live part of the year in Turkey and, as a vegetarian enjoy these dishes often. No meat needed, you get all the protein and vitamins if you add fresh fruit as dessert. …and the fruit is great in most parts of Turkey. Where do you live part of the year? Great list – Having just returned from Turkey, Nicole (wife and vegetarian) was wondering if she’d be able to survive with all its meat selections. This post is very helpful… and it’s making me hungry! Any particular favorites she stumbled across? We are complete meatatarians but we’ve now realised there is life on the other side! 🙂 Love love love menemen, börek, cacık…oh and nohut…just everything on your list really. The food looks delicious!! I got addicted to Baklava when I visited Turkey for the first time, but hardly remember any of the other food I ate there (I think I survived solely on falafel 😉 …) so I guess it’s time to go back! Yes, your taste buds will thank you! That Cig Kofte even looks spicy! That will be tops on my list when I make it to Turkey eventually…it looks vaguely Indian in nature…is it curry-like? Great pictures, Anil! These dishes look yummy and I know for a fact that they taste great, too. Menemen is a perfect treat for brunch and borek is for all times. You can put anything in it: potatoes, eggplant, cheese, spinach, zucchini, ground beef, even bulghur! Cig kofte is one of my favorites, I must admit. My husband can’t understand why I crave for Turkish food. Maybe I’ll share these pictures with him! Yum! While I’m not a vegetarian, I tend to eat a veggie-heavy diet–and it’s nice to know that there are so many options in Turkey! All of that food looks absolutely delicious! Variety in cuisine is certainly a Turkish strong point. As Anthony Bourdain mentioned when he visited Istanbul, the Turks should forget about showing anything else other than food in their tourism commercials. And cool blog you have! Lahmacun…mmmm, a great Turkish treat with meat. So simple yet so tasty! 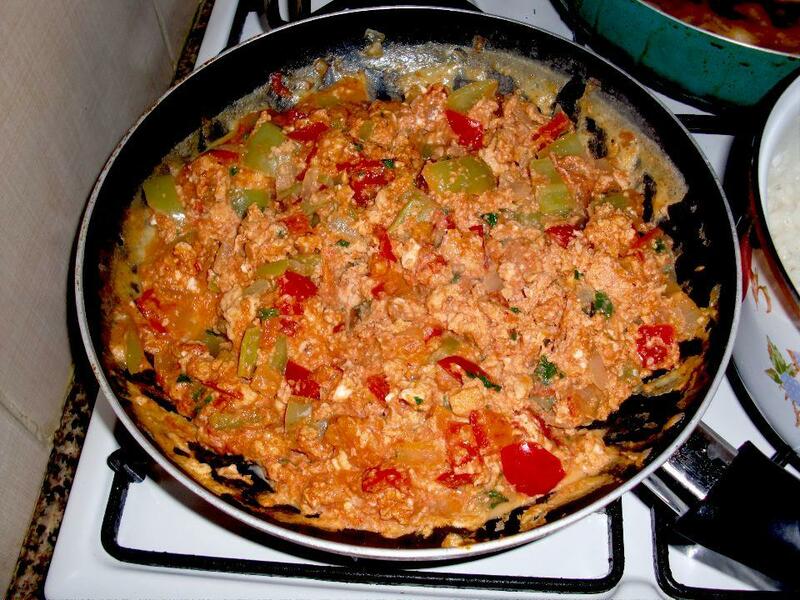 I am not really a lover of Turkish Foods however I do like Menemen. It is also fab if you are not very good at cooking because it is impossible to get it wrong. Absolutely true! How can you go wrong with lightly cooked eggs 🙂 Surprised to hear you’re not a big fan of Turkish food though! I was a meat eater when I went to Turkey back in ’03 and I didn’t really like the food. I found it way too meaty and heavy. Now that I am a vegetarian, I am really happy to see that there are options in Turkey for us. Makes me even more excited to get back there. Mmm, sounds great! Thanks for writing such a useful post for us veggies. Can’t wait to get there and try it all. It’s my pleasure – with these veggie foods too you’ll save *a lot* of money in Turkey as well. If we ever cross paths in Turkey I’ll buy you a cig kofte wrap, my promise! OMG! You have made this vegetarian SO hungry. I LOVE dolma and tzatziki but now can’t wait to try the others. Cig kofte is an underrated food I think you’ll enjoy – there are also lentil koftes, okra, oh my, I’m getting hungry too! I am not vegetarian, but these dishes look delicious. Wouldn’t mind trying them out. Fabulos post and blog! I discovered yor blog while searching on turkish for travelers. Read this post and the one on 48 hours in Istanbul.. My hubby and I will be in Istanbul for 4 days in sept. I am a veggie so loved this post! What are your favorite patlican (eggplant) dishes? Thank you very much 🙂 Have you been to Istanbul before; let me know if you have any questions before then and hope you have a wonderful trip. But I didn’t know about the veggie versions of meatballs. Missed out on that, since i thought that meatballs would have, um…. meat. Dang! Hi Arundhati, many people think of Turkish food as all meaty kebap and I think many (vegetarians included) are surprised to find otherwise. Based on your blog post I’d say you did a pretty good job of finding the best of non-meat food in Turkey. …and for the cig kofte (raw meatballs), they changed everything but the name! Thanks Anil for the wonderful article and photographs. Am vacationing in Turkey this April with my wife- and am carrying a printout of this page so that I dont miss out on all these delights! My pleasure Vishnu. I know many more veggie dishes so if you’d like any more let me know and I’ll send over some suggestions. Where in Turkey are you headed? This is great news for vegans as well as vegetarians! I didn’t know about these delicious dishes in Turkey! I thought the cuisine was all about meat and vegetarians and vegans would struggle. As a vegan I love the sound of the Cig Kofte and the Zeytinyagli Dolma! It’s a common misconception but you’ll find a lot of vegetarian foods – and vegan as well, though butter and yogurt are probably the biggest obstacles I’m assuming. Thanks for this article. Am visiting Turkey next week for a family holiday and was slightly worried because we are vegetarians. Relieved after reading. I’m happy to hear it, have a great trip. I am a vegetarian living in India ..I want to settle in turkey ..Can I survive there with these foods? I live in India..and I want to settle in turkey after sometime…Also I am a pure vegetarian…can I survive there in turkey….? You’re welcome! If you have any other questions please feel free to ask! This is fantastic Anil, I am definitely hungry! Lot of Indian food has been adapted from Turkish – pilavs (rice with beans), koftas (with lentil batter), dolmas (stuffed peppers, vine leaves) – all vegetarian and so delicious! I especially love what they do with eggplant. It took me a long time to embrace eggplant as a child but couldn’t resist as I grew older. I also didn’t know that many Indian foods had been adapted from Turkish varieties; I love vegetarian Indian food – I can now see the connection!